Sometimes bigger can mean more expensive or even more complicated. It can also mean something is harder to move and transport. Compact products are often superior, provided they don’t lack in quality or features. Musicians have for years now been victim to a type of programming. They’ve been programmed to believe bigger is indeed better as far as amplification goes. Just the thought of a “guitar speaker” brings to mind the rock star standing in front of a wall of cabs. But what about for the small practice rooms when you’re playing with friends or even alone? How about for private gigs where you need enough amplification to give you good sound but not enough to rattle the windows? There’s also the matter of traveling – those electric guitarists who stay on the go may miss the one-of-a-kind sound that their instrument offers. A smaller amp fits the bill perfectly for beginners, travelers, and players whose situations warrant compact design over lavish speaker size. Fender is well-known among musicians for their guitars, basses, strings, and of course their amps. Here’s a look at the Fender Frontman 25r. We know it’s class and price range – but is it worth the cash compared to other amps of the same type? 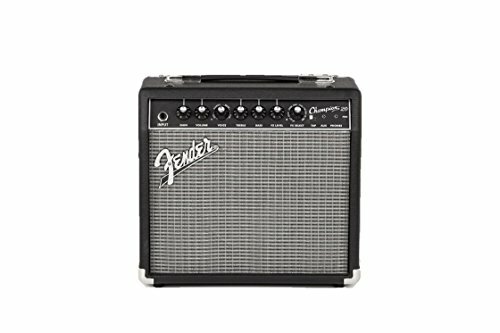 What Does the Fender Frontman 25r Offer? How Much Can It Influence Your Sound? This is another symptom of the notion that a larger amp is somehow better, and therefore smaller amps would ultimately be abandoned by skilled players. But the 25 watts offered by this model are more than enough for small practice sessions, packing around on vacation, or even small shows. This speaker is small and covered in a stylish silver or black grille clothe, and held in a basic but solid frame. The convenient handle and low weight make this amp easy to pick up and carry around. Instrument in one hand, amp in the other – setting up for your part of the session in one trip is a convenience that never goes out of style. The amp has the basic controls one would expect such as normal volume and an individual control for treble, middle, and bass. For expert players who know their preferred sound, it’s easy to dial it in right away without having to read any instructions. For the beginner player, it’s a simple layout that makes learning easy. There’s also a gain control, reverb control, and even drive channel feature – but this moves into the territory of discussing effects. When a person who has a history of playing music looks for an amplifier, one thing they may immediately consider is the effects it offers. Effects with amplification go back nearly a century, with studio engineers hanging reverb plates along speakers or prepping a room for hours to get the proper delay-style sound. These days, effects are built right into the amp – but how much can you expect from a product admittedly aimed at beginners or longtime players looking for a budget deal? This feature will sound more like an effect than anything – though it’s technically a second channel. The drive button of this amp activates the “dirty” channel as opposed to the clean one that it’s set on by default. Great for those styles that need a little gain to them, this feature means the amp can appeal to musicians of all genres. It’s also possible to get creative by using separate pedal effects like chorus then applying drive or by using a separate fuzz pedal on the clean channel – there are endless possibilities. There’s also a reverb control, which can add a lot of character to the signal. Once again, applying this effect in various amounts on top of other tones can create some unique results. It’s enough of an effect to add that extra something to the guitar’s sound, but it’s not complicated enough to confuse effects novices – or to raise the price too high. Experimenting with the amp’s sound on both channels and with varying levels of reverb can create a variety of sounds. Be wary of using too much gain and distortion, especially if you’re bunched up in the practice room playing close to the speaker – feedback can be pain. But applied in generous amounts or with a simple noise suppressor pedal thrown on the line, this can be avoided. For many musicians, collecting gear is as much fun as actually playing. There’s some logic to this – gear can help create a one-of-a-kind sound, make it easier to create music, or both. Even for the beginner guitarist who has a guitar, an amp, and nothing more, it may not stay like that forever. They may develop new needs for additional equipment to develop their sound or help them with current musical needs. The Fender Frontman 25r has a built-in auxiliary input. Plug in mixers, recorders, drum machines, monitors, mics, and more – no matter which way your musical journey takes you, a simple all-purpose functionality like this is likely to come in handy. There’s also an input for headphones in case you want to play in private, as well as a footswitch input. Switches can be programmed in various ways, but the option here is likely to switch between the clean and drive channels. While some players accomplish this with pedalboards, the added input options let musicians change their sound through their amp’s own peripheral option without messing with their pedal setup – and without requiring them to miss a note. It’s one of those amps geared toward the beginner musician, but also the person who needs an all-purpose tool for a specific purpose. You can theoretically add a set of headphones, a small drum machine/synthesizer, and a standard foot switch without adding more than another gear bag to your equipment load. There are plenty of practice amps that check all the boxes for appropriate speaker side, good looks, and all basic needs included. But what makes the Fender Frontman 25r such a highly sought-after amp in this category? The answer is simple – the makers behind it. While some think that buying an amp just based off the name alone is foolish, it’s important to remember how Fender got its name. The company is so known for quality that even their practice amps are superior to their competitors in many ways. That distinct Fender sound and construction are the same one that goes into massive stacks and instruments that fetch thousands of dollars. It’s easy to argue the same amount of workmanship didn’t go into those products as this one, but $100 worth of Fender workmanship could get you a lot more value that $100 of a competitor. Sure, there are other big names in the industry who make great amps in this category. But there’s a reason the Fender Frontman 25r is still beloved in many circles. Solid quality means these amps hold up well over time. Fender plans on being around decades in the future – the local startup instrument company may not. They don’t have as much of an issue if the product they sell you falls apart after a decade or so. Fender does, and that’s why their products usually last longer. Obviously, the Fender Frontman 25r is never going to fill a stadium with the sounds of a roaring guitar. It may not even have the output to keep around in small studios, even where space is limited. But as far as being a well-rounded amp for starting musicians and those who are concerned about saving money or space, it’s hard to beat the 25r. It’s made by a company that understands the needs of musicians and that doesn’t cut corners with their products. Sometimes the rarity of these amps can cause their price to hover up to $150, or even above for models with unique cases or alternate design styles. The amps can even be found for under $100 in many cases if the buyer is willing to buy pre-owned. This combination of features would make for a satisfactory product if they were made by anyone – but that touch of Fender quality puts it over the top. It won’t rattle any windows or melt any faces with the effects – because it isn’t supposed to. But for any musician who wants the most value in a small, practice, or beginner’s amp, the Fender Frontman 25r is definitely worth considering. It’s also worth noting this amp and others similar to it are sometimes bundled with beginner guitars. It’s just a testament to how much faith the company puts in them, and how they remain such a solid choice for those who play small gigs, those who are still learning, and those who know that compact amps still have a lot to offer.